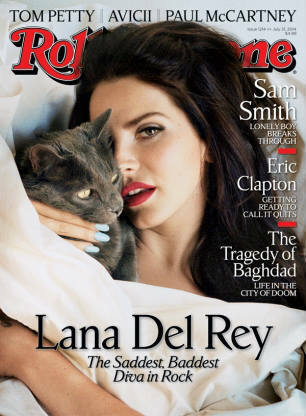 –Lana Del Rey does her mopey, put-upon thing in the new issue of Rolling Stone, saying she wishes she wasn’t on the cover and her lyrics are none of anyone’s business. On the plus side, I guess there’s something a bit refreshing about a celebrity who seems to go out of her way to make us all really dislike her. -Friends forever! Jennifer Aniston, Courteney Cox and Lisa Kudrow reunited for dinner last night. -So Drake and Chris Brown are all buddy-buddy now? First they were spotted in the studio together, and last night they appeared in the same skit on the ESPYs. Sigh. -Congrats to Shakira, who is reportedly pregnant again. –Beyonce is very good at a very long list of things, but songwriting might not be one of them. -I saw Cory Monteith‘s mom on Good Morning America today and it was sad and sweet and gut-punching. -RIP, Elaine Stritch (aka my spirit animal). –Jason Biggs has a long history with offending people on Twitter, but his tweet today about the Malaysian Airlines tragedy is beyond gross. –Ryan Reynolds and Katie Holmes make a convincing-looking married couple. –Jared Leto was strolling around Paris today with a rose hanging out from his belt because he’s THE WORST. -Poo! Gone Girl won’t premiere at TIFF. Though as long as This Is Where I Leave You makes it here, I’ll be happy. -Ruh roh. Aaron Paul’s new movie A Long Way Down is getting terrible, terrible reviews. -Alias star Michael Vartan is back on the market after announcing his split from his wife of three years. Poor Agent Vaughn. -Now there are rumours that Ewan McGregor might join the second season of True Detective. Make this happen, universe! -Yesterday on GMA, Emma Stone said working with Colin Firth was “terrible” and then she called him a “tool bag” on Letterman. Adorabs!